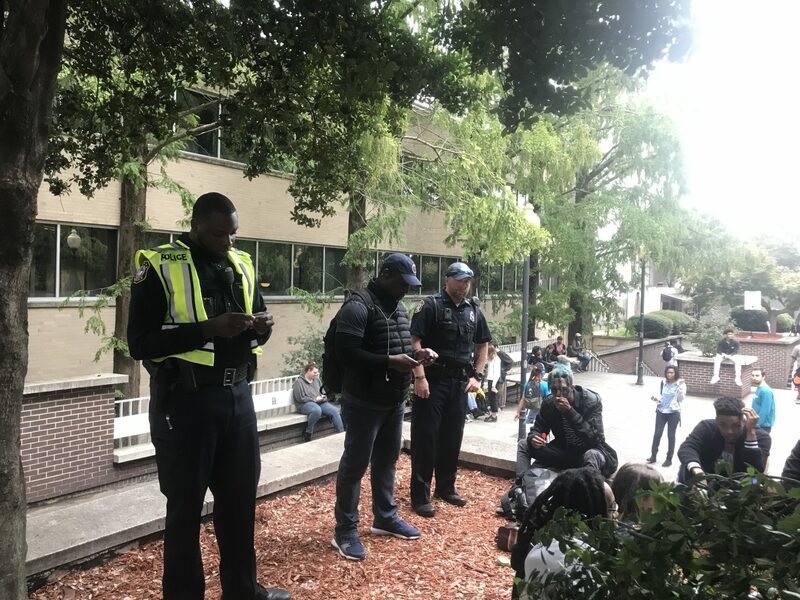 An undercover Georgia State University Police Department officer confronted and charged two Georgia State students in Library Plaza for possession of marijuana on Thursday afternoon. At least two undercover officers were present during the incident. The disguised officers were accompanied by three other uniformed GSUPD officers. The undercover officer who questioned the students primarily focused on one of the individuals who was in possession of marijuana along with various drug paraphernalia such as rolling papers. When the police asked for his PantherCard or some other form of identification, he claimed he didn’t have his wallet on him. After several minutes of interrogative dialogue, one officer patted him down and confiscated his wallet that was inside his pants pocket. “You ever been to jail before? Answer my question. You ever been to jail before?” he said. The students were sitting in a group with eight other students in the plaza’s smircle. One person, who is not a Georgia State student, was arrested for having outstanding warrants in another county. The police gathered the other students’ PantherCards and ran them through a database to check their police records. Many students were unaware of an undercover police presence on campus, as this public ordeal drew the awe and ire of a crowd of students. GSUPD Chief Joseph Spillane said there has been an increase in not only undercover police but also in their Crime Suppression Unit and motorcycle patrols. The undercover police operate in a variety of ways. Some patrol high-traffic areas and others, according to Spillane, plant bikes that thieves then steal. “We have bicycles that we plant, then undercover watches the bicycle. And then they keep an eye out for people who go into places they aren’t supposed to be, like they’ll piggyback in … particularly in housing,” he said. Spillane said the increase in police activity is a department-wide increase. He said that Georgia State University President Mark Becker “doubled the size of the police force downtown,” following a series of robberies that took place three years ago. “It’s not because crime’s up. Crime’s actually way down. But we have a larger force now so we have more units to work with,” he said. The smircle has been on the university’s radar for several years. Spillane said that the police can’t enforce the no smoking policy, but security for the university can. Due to complaints from students and faculty, Spillane said he wanted someone to focus on stopping students from smoking on campus. “Frankly it should be being enforced by somebody so we’re trying to put together some kind of plan to actually enforce it,” Spillane said. The chief said that he’s looking into an initiative proposed by the Student Government Association, a plan that has already been retracted by the senators at their latest Atlanta senate meeting. GSUPD doesn’t have the authority to enforce a university policy such as the no smoking rule.